a) what is the y-intercept? 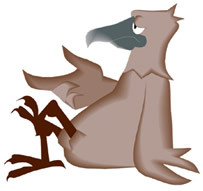 b) what is the the domain? c) what is the range? 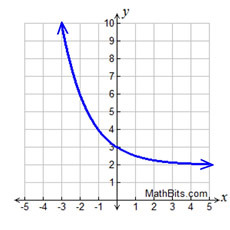 d) what is the asymptote? Which of the following statements is NOT true regarding the exponential function y = 2x + 4 ? The average rate of change is constant. 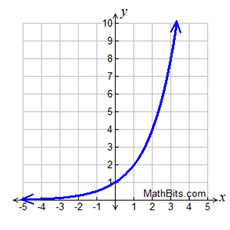 The asymptote is y = 4. 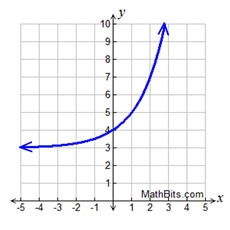 Which graph represents the function y = 3x+ 2 ? Which of the following tables displays an exponential function? a) Which function has a constant rate of change? b) Which function has an end behavior y → +∞ as x → +∞ ? c) Which function increases at a faster rate? d) Which function has a y-intercept at (0,0)? Two functions are shown in the tables at the right. a) Which of the following is true? b) Which function has a common difference (equal differences over equal intervals)? c) Which function can be modeled by the equation y = 4x ? Which choice is an exponential function of the form f (x) = abx that can be used to represent the data displayed in the chart at the right? 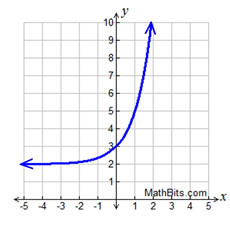 Consider the graph of y = 4x. a) What happens to y as x gets smaller? b) Will the value of y ever equal zero? c) What is the domain of function y ?